Stories help us filter our experiences and make sense of life. They run through our minds every day as thoughts, observations, judgments, patterns, and reactions to experiences. Stepping back to identify our stories that are on “automatic pilot” can foster a deeper understanding of who we are, what we want, and what motivates us. 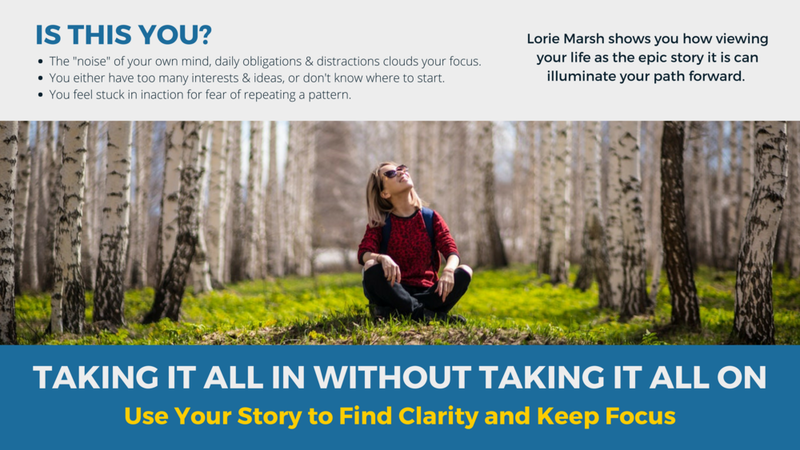 I work one-on-one with multi-passionate creatives and entrepreneurial leaders and mid-life/mid-career women who who want to navigate overwhelm with more focus, make life/work transitions purposefully, and make choices with clarity and confidence. I love listening to people and helping them glean A Ha! Moments from the stories they have about themselves and their lives. Let’s mine the automatic thoughts and swirling stories you carry with you, day in and day out, and see them clearly to decide whether they're serving your growth, or limiting your potential. If they're limiting you, I guide you to think like the Author of your life that you are, and identify ways to re-frame them. We’ll use my About Sentence framework to create a concise description of your life narrative. Through this work together, you identify who you are, what your “tragic flaw” is, what you want, and what motivates you. Create a resulting “at-a-glance road map/cheat sheet” – your About Sentence – to stay attuned to your intention and motivation in your daily life. and email support between sessions over the course of 4 to 6 weeks. I can also record our sessions to share with you, if you like. All sessions are done via my ZOOM virtual office, or in person if you’re local to Minneapolis / St. Paul, Minnesota. Sessions will consist of discussions about your results from working with the worksheets of each course module. Payment can be made through Paypal (I will invoice you) or by sending a check in advance to me (I’ll give you the address).